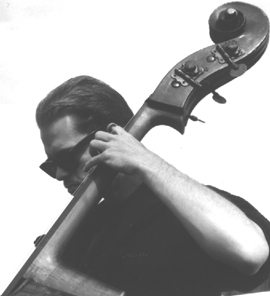 Nick Kaçal (pronounced Kasaal) is a double bassist and audio engineer (including work as an acoustician, mixer, recordist and producer). Originally from Trinidad, he is currently resident in London. He studied Electroacoustics at Salford University (graduating in 1990) where he became involved with the local jazz scene. 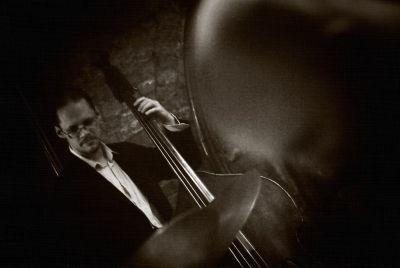 Originally a guitarist and electric bassist, the involvement with the Manchester jazz scene led to him discovering the double bass as his instrument of choice. After graduating from Salford, he worked in the music industry and began a slow transition to professional musician. After studying with Tony Hougham, the principle bass of the Covent Garden Opera, he moved to London and became a full time musician in 1998. Since then he has played as a sideman on the London music scene playing predominantly jazz and acoustic folk, occasionally touring to places such as Cape Verde, France and Spain. He formed his own group, Guerillasound, releasing a CD in 2008 and touring successfully in Japan. In the last few years, his science and engineering background has led to him returning to acoustics and audio, with increasing work as a recordist, mix engineer and producer, with a base in his own small mix and tracking studio - Guerilla Sound Recordings. He has produced and recorded jazz, folk and classical artists in sizes from solo singer-songwriters to full orchestras, becoming a specialist in location work and an adept at recording live ensemble music. He has recently produced, recorded and mixed full albums for One Little Indian act Songdog and Barcelona artist The Big Head Troubled Boy.